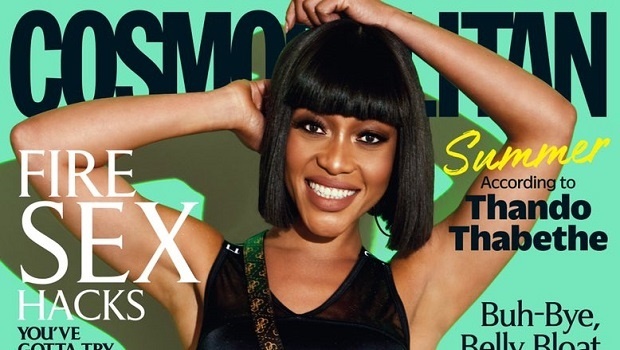 a slightly darker Thando adorns the cover of Cosmopolitan . A slightly darker Thando Thabethe left a few fans unimpressed. But the reasons for their unhappiness raised some concerns. In the past many magazines have come under fire for major Photoshop fails leaving our favourite celebrities with either a lighter complexion, curves slimmed or a new airbrushed look, like a year ago where Grazia lopped off Lupita Nyong'o's ponytail. Countless tales can be told about the matter, but the most recent, involving the radio and television personality Thando, opened a whole new can of worms after some of the comments made by her supporters come across as colourist. Some of her fans, who were quick to comment on the fact that the starlet appears a few shades darker than normal on the latest cover of Cosmopolitan, seem to expose the sad reality of how prevalent colourism is around the world. Some of the comments made on her IG post praised the radio presenter slash actress slash lingerie business owner for having "lighter skin" with poorly chosen words like "yellow bunny". Our #summerissue is here ft cover girl @Thando_Thabethe ???? Grab it to get the scoop on Thabooty's hottest summer hangouts! ? ?Also in this issue: 50+ swimsuits, how to have a no-strings holiday fling (& stay safe), and under R250 beach bag beauty essentials? PS. Pick up the issue before all the FREE tote bags are gone! They’re a summer must-have! ?? #COSMOxThando dressed by the best @guess #guesssouthafrica?? But if you take a look at the photo below, posted on Thando's page, the difference to the cover isn't that unwieldy? Gave my @thabootys a break ?????? Using words like yellow bone and yellow bunny is colourist. More so, romanticising lighter skin is centred around racism and is beyond problematic. Especially since we know the dangerous lengths some will go to to achieve a lighter complexion - like unsafe skin bleaching. It's important for stars to feel that the way they are represented speaks true to themselves. And according to Timeslive, Thando did express how she felt to the editor. This is what their reporter revealed. Thando says, "'I agree that, yes, I do look darker. I have spoken to the editor and she assured me that they did not do anything so I take her word for it.'" "Cosmopolitan editor Holly Meadows told TshisaLIVE that the image was not altered. "'Thando Thabethe is a remarkable woman and we are proud to have her star on this month's Cosmopolitan cover. We have not, and will never alter a cover star's skin tone. This goes against the grain of our core brand values, which include diverse and true representation of all women.'" What do you think about the issue of colourism? Chat to us here. READ MORE: Skin lightening - what are people using and how dangerous is it really? Sign up to W24's newsletter so that you don't miss out on any of our hot stories and giveaways. Skin lightening in 2017 - what are people using and how dangerous is it really?